Liberty is a pure bred Chocolate Lab. Her full name is Nestle's Liberty Belle. She was born on 3 December 97 and is owned by Todd & Sara Gibney of Fawn Grove. 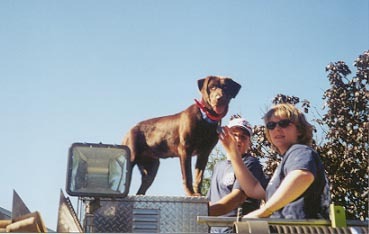 Liberty can be found riding the top of Engine 3 during most parades and his a major hit with the children along the parade route. Liberty's interests include bird chasing, playing frisbee, swimming, and going down to Cody's house. Cody's real name is Dakota of Cherokee. She is a pure bred Black Lab and was born in 1992. She is owned by Kevin Gibney of Fawn Grove. Cody is a self proclaimed Penn State fan. 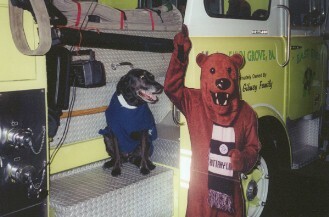 She enjoys hanging out with the "Nittany Lion", wearing her PSU sweater, and listening to music from the Blue Band. 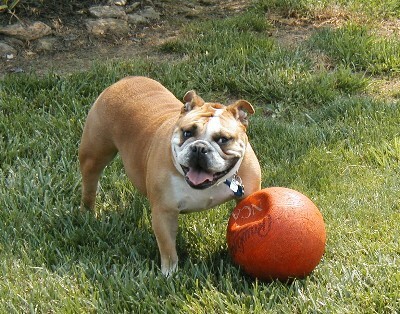 Sasha is a pure bred English Bulldog. She is 1 1/2 years old and is owned by Kevin Gibney of Fawn Grove. Sasha's interests include eating, sleeping, playing basketball, and fighting with Liberty. Butch is a 5' tall statue of the mighty emblem of Mack Trucks. For years, it sat perched above the Mack Truck dealer in Pliladelphia for all to admire. Now retired, it will enjoy riding atop of Engine 3. 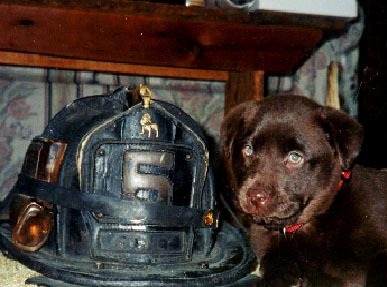 A "Fire Dog" is born!